There almost too many highlights to recall during the memorial service for New Orleans music legend Allen Toussaint on Nov. 20, 2015, at the Orpheum Theater — not the least of which being the memories shared by other music legends. One after another, greats such as Jimmy Buffett, Boz Scaggs and New Orleans’ own Irma Thomas remembered the musician and the man. And then there was Elvis Costello, whose post-Katrina collaboration with Toussaint, Grammy nominee “The River in Reverse,” is a cherished piece of audio healing around these parts. Costello, wearing one of his trademark fedoras, read simply from his script in recalling how he joined a cavalcade of other musicians seeking out wisdom from Toussaint like pilgrims. “To me he seemed like an elegant prince out of history, gracious, generous, ever curious about what came next, but so modest,” Costello said. It should come as no surprise that Costello, a brilliant songwriter in his own right, should pen such a lovely tribute, so I’ll just post the audio and let you enjoy his seven-minute soliloquy. His story about Toussaint’s natty attire is worth the listen alone, filled with vivid detail and knowing humor that had the audience laughing through the tears. I won’t spoil the moment. Enjoy for yourself. Costello returns to New Orleans on Thursday (April 28) for the New Orleans Jazz & Heritage Festival presented by Shell, performing from 5:30 p.m. to 7 p.m. at the Gentilly Stage. It also should be noted that on Friday, you might consider checking out “The Life and Music of Allen Toussaint,” with Irma Thomas, Cyril Neville, Renard Poche, Herman LeBeaux, and C. Reginald Toussaint, interviewed by Ben Sandmel. It’s at 1 p.m. at the Allison Miner Music Heritage Stage. Every now and then, the New Orleans music community suffers a loss that goes even deeper than usual. When Allen Toussaint died at age 77 after a show in Spain, the loss reverberated around New Orleans and, really the rest of the world. It was so profound that, one could make the case it was the greatest loss since the passing of Louis Armstrong nearly 45 years ago. To name-check another great, it felt like we had lost our Cole Porter, for in Toussaint we lost a man who could make gritty New Orleans rhythm and blues, and its feisty child, funk, sound elegant and accessible to everyone. That was Toussaint in real life: elegant, and accessible to everyone. Which is why you didn’t even have to for wait entry into the Orpheum Theater on Friday (Nov. 20) for a sweet memory about Toussaint, even if there would be many shared in the tribute played out on the stage with a star-studded lineup and in front of a grieving family in the first few rows and grieving fans packed to the third-floor balcony. As we waited in line to get in — the doors opened at 8 a.m., but fans were queuing up well before 7:30 a.m. — fans stood in silence. Until they couldn’t. Right beside me, seemingly unprovoked, Maureen Morrow, a woman looking to be in her late 40s or early 50s spoke about how she’d seen Toussaint at the 1982 New Orleans Jazz Fest and, benefiting from one of his post-show customs of tossing out personal items, got to snag his songbook. To her right, Annie Lousteau, graying and probably in her 60s, lit up, and reminisced about how, as an aspiring musician in her youth, sitting on Toussaint’s piano stool in his studio and strumming her guitar. He’d encouraged her to become a musician, she remembered, and she later pursued work in children’s musical theater. These personal moments echoed what New Orleanians had been saying throughout the past week, remembering musical and run-in moments with Toussaint, who was difficult to miss while moving about the community in his signature Rolls-Royces (he had two) and his natty, colorful attire. He seemed to love posing for fans — including me and my son, Eli, when we caught him passing by the City Park playground on his way over to Morning Call during Jazz Fest. 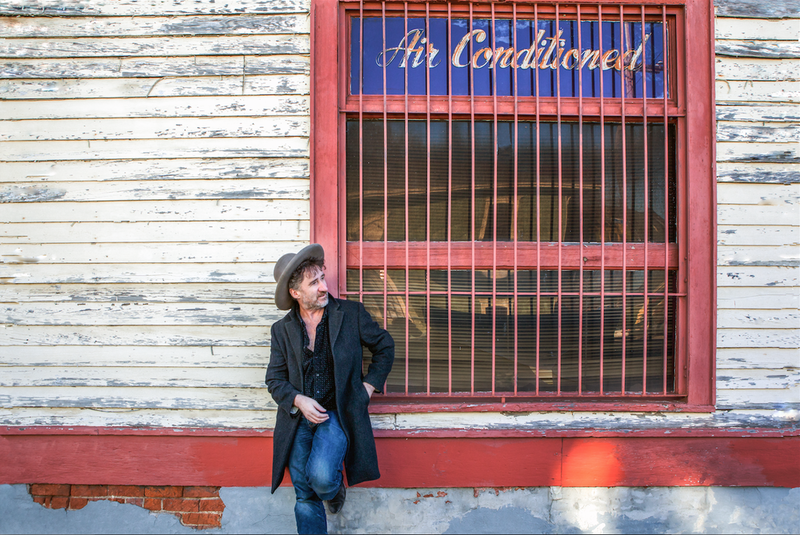 There were other magical musical moments: Davell Crawford’s sweet, wistful “Southern Nights,” Irma Thomas’ “Walk Around Heaven All Day,” Boz Scaggs’ “What Do You Want the Girl to Do?” (backed by Jon Cleary & the Absolute Monster Gentlemen), and so on. My personal favorite performance was arguably the least soulful moment, when Jimmy Buffett strode out in respectful but hipster black and performed a kind of deconstructive version of “Fortune Teller.” Buffett, never the world’s greatest vocalist, brought out all the mischief and cleverness of the lyrics, and accented certain moments of the ending (really, a punchline to a joke) — Now I’m a happy fellow / Well I’m married to the fortune teller / We’re happy as we can be / And I get my fortune told for free.” It was the accent on that last note, and a knowing grin by Buffett, that drew guffaws from the audience. “Ohhh, he had a sense of humor!” Buffett said, getting more chuckles. The day ended in typical New Orleans music and funeral splendor, with the Preservation Hall Jazz Band’s version of “Yes We Can Can” (with Boutté on vocals) followed by the more somber “Just a Closer Walk with Thee” and then “I’ll Fly Away” in what amounted to an all-star jam of all who came before with Trombone Shorty thrown in for good measure. Pall-bearers carried the coffin, fashioned by Rhodes, out to waiting hearse with hundreds watching along the sidewalk and on the street. How many of them out on the street had their own Allen Toussaint moment — on the stages at Jazz Fest, in the dusty music halls of the ’60s, in the New York clubs, or maybe even over at City Park catching a selfie? I’ll have more on the tribute to Allen Toussaint on Friday (Nov. 20) at the Orpheum Theater. It was an overwhelming experience fill with memories, music and emotion. Until then, here’s a photo gallery (with a few duplicates/extras), which I’ll tidy up with the post. Upon learning the news of Allen Toussaint’s passing on Nov. 10 at the age of 77, the first name that came to my mind was Jon Cleary, and not just because he is my favorite New Orleans piano player, or because I’d profiled him and the making of “Pin Your Spin” for Gambit Weekly back in 2004. It was, more appropriately, Cleary’s 2012 album, “Occapella,” a brilliant reimagining of some of Toussaint’s more popular (and some less popular) works. Normally when I make a record I’m writing the songs as well, so there’s this other process where you’re agonizing over lyrics and arrangements, but the thing with Allan’s tunes is that the songs are good, the lyrics are good, and the arrangements have these key little signature things. My approach to it was identifying the most important elements, breaking the song down to its fundamentals and then building it back up again. Hopefully I’ll have more of this interview, which also touched on Cleary’s general impressions on Toussaint’s musical legacy, but because he’s already said some of this, I thought it would be fun to hear his creative process on “Occapella” straight from his lips. Listen below. While working in the previous gig, doing social media roundups was a regular thing, and sometimes felt a little bit like a reflexive thing. But as the tributes come pouring in on the news Tuesday (Nov. 10) of Allen Toussaint’s passing, I thought it appropriate to revive the practice here. Why? 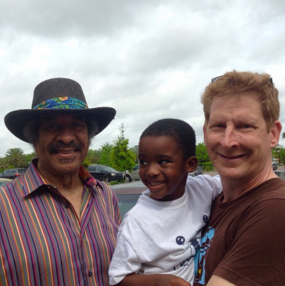 Because it seemed like Allen Toussaint was everywhere, and, perhaps more important, gracious with everyone he met. In just this past year, around Mardi Gras and then around Jazz Fest (appropriately enough), I either saw and waved at Toussaint (in his vintage Rolls Royce, about to park and head inside Restaurant August) or convinced him to take a selfie with my son Eli as he was making his way from that Rolls to Morning Call in City Park. I’m not alone. Everyone, it seems, has a photo of them taken with (or especially of) him, if Facebook is any indication this morning. Here are some of these and other memories I’ve pulled from social media. What’s also amazing is the range of video clips of his work that are pouring out, showing the breadth and depth of his talent. Feel free to share you memories of him in the comments. One final memory, and it’s a deep one or anything, but I think the year was 2000, and my old boss Michael Tisserand at Gambit Weekly invited me as his plus one to the New Orleans Jazz & Heritage Foundation’s gala. And Toussaint was the headliner. What a way to see him perform for the first time. I love to say how fun it is to see great music in gritty, homey nightclubs, but it seemed only fitting to watch Toussaint in a festive room, decked out in a tuxedo (as if he’d dress any differently for any other gig), and leisurely rolling through his vast catalogue. Brilliant stuff, and memorable. The material on this site may not be reproduced, distributed or otherwise used, except with permission of David Lee Simmons.